I think that gold, or any metallics for that matter, are really easy to style and introduce into any space - they tend to fit nicely in any interior and sit comfortably in all styles. For example, if you're going for a girly and on-trend space, mix with white and accents of pink, or for a more rustic/traditional look style with a mixture of blue hues, from mint to navy. How would you, or do you, style gold? I love how gold accents look in a monochrome or very simple room! I don't think I'm quite ready to jump straight into clashing pastel walls, even if I've always wanted to live on a Wes Anderson set, but I wouldn't think twice about filling my room with pink accessories and stationery. 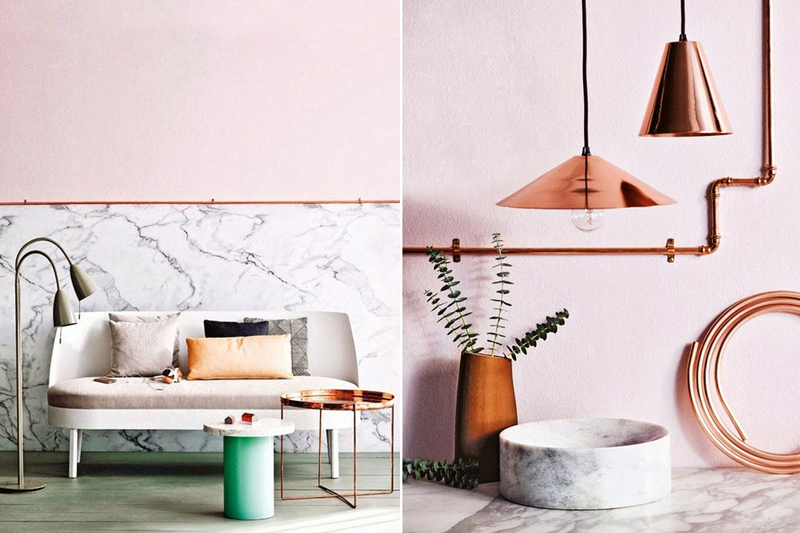 Below are some of my favourite pink and copper pieces at the moment - what do you think about the trend? Thoughts on a postcard! The start of a new year not only brings long lists of goals and resolutions but welcomes exciting new collections. And H&M Home is one that I'm sure you've been looking forward to just as much as I have. Making a name for themselves as every flat-lay lovers dream, H&M Home's new spring collection looks just as promising and swoon-worthy as we all hoped. Last year's highly covetable trends have been given a little update, with the title of 'must-have metal' now sitting comfortably with brass instead of copper, and uber-tropical patterns now taking a more natural stance with ferns and muted greens. H&M Home's spring collection is all about the urban jungle; house plants sit pride of place in every room, whether they're featured on bedding, cushions, plates or just sitting pretty in a rustic wooden pot. As I expected, I really love the collection, especially the mix of warm golds and feminine pinks with the cooler hues of green. It all just makes me wish I was living in a cool warehouse apartment in LA - anyone else? The collection houses a wide range of colours and tropical inspired patterns, from dominating leaves to simple geometric repeats. I love how lots of different types of materials are celebrated, with metals, rustic woods, wool and even jute. Below are just a few of my favourites pieces - what do you think of the collection? H&M Home's Spring 2016 collection is now available online and in stores. Anyone fancy popping to one with me?